Ahh, February… the month of romance and love, roses and chocolates… not to mention jilted lovers and quarreling spouses. As a marital therapist, I have often wondered whether Valentine’s Day does more overall harm than good. Don’t get me wrong, I am in favor of romance and passion, but there’s something about Valentine’s Day that sets the scene for unmet expectations and lovers’ quarrels. And, of course, nothing ruins a day– especially a day dedicated to love– faster than harsh words, raised voices, and cold silence. Unfortunately, even among the happiest of couples, these distance-creating arguments can sneak up at the most inopportune times. How do you avoid the nasty blowups that make you feel like your relationship is sinking? Thankfully, marital research provides us with some helpful tips. Do you ever feel like an argument with your spouse is going nowhere productive? Trust that feeling– you’re probably right. This doesn’t mean your relationship is doomed, just that the particular conversation is beyond recall. According to world-renowned marital researcher John Gottman, Ph.D., “96 percent of the time you can predict the outcome of a conversation based on the first three minutes.” Gottman’s research shows that a “harsh start-up” will almost always produce a negative result. His message for couples? First, focus on approaching your partner in a respectful, non-attacking way. Second, if a conversation starts harshly, recognize that your odds of getting back on track are slim. Take a breather, and try again later. Why is it so difficult to salvage a discussion that has started harshly? Often, harsh remarks trigger intense negative emotions like anger and fear, and when these emotions wash over us, our internal fight-or- flight mechanism “floods” us with physiological responses like a racing heartbeat, sweaty palms, tightness in the chest, trembling hands, nausea, or a headache. Gottman’s research shows that when we are in this “flooded” state, we don’t think as clearly or process information as effectively. In other words, when we are angry, we are less likely to listen to our spouse, and less able to see our spouse or our relationship accurately. “Isn’t it important to share my emotions with my spouse?” you might ask best task manager. Yes, but when working through a conflict with your spouse, flooding is not your friend. This is difficult to remember when you are upset, but if you and your partner can agree in advance to “take a break” from the discussion when either one of you becomes flooded, you are more likely to have a productive conversation when you are both calm again. How do you know when it’s safe to try again? When the flooding is gone. Twenty minutes can often work wonders. As a final point, it’s also worth noting that Gottman has found that some people, especially men, find flooding so aversive that they try to escape it as quickly as possible. If your spouse tends run away from arguments, s/he may be trying to escape the “flooding,” not the relationship itself. Another red flag to be aware of occurs when you switch from complaining about something your spouse does and begin criticizing your spouse as a person. A complaint sounds like, “You didn’t call when you said you would call,” while a criticism sounds like, “You are so selfish! I can’t believe you forgot to call! You only think of yourself!” Yes, we are all flawed in some ways and, of course, we usually have intimate knowledge of our partner’s flaws. However, criticizing your spouse as a person will usually elicit defensiveness rather than the openness to change that you desire. Attacking your spouse as a person can also take the form of expressing contempt for your partner. Once you start feeling contempt, it’s time to take a step back, because anything you say from that moment on will tear at the fabric of your relationship. Gottman’s research demonstrates that criticism (“character assassination”) and contempt are so destructive that their repeated presence in a relationship is predictive of future divorce. Whenever you start thinking, “My spouse is the problem,” stop and try to get perspective before proceeding. If abuse, addiction, or mental illness is at a play, you may be correct in assuming the problem won’t change much until your partner gets help (however, rage and contempt rarely persuade a spouse to seek treatment). If none of these factors are part of your relationship and your spouse is otherwise a decent human being, you are likely losing sight of some important information about the situation or your spouse. Seeing one’s own relationship accurately isn’t easy, and one’s view of a relationship is influenced by so many different filters (e.g., past experiences, belief systems, etc), that volumes of self-help books have been written on the topic. However, one filter that arises for most couples is the “fundamental attribution bias” (Fritz Heider, 1958). According to the fundamental attribution bias, when we explain our own negative behavior, we often attribute it to situational factors (“I was having a stressful day,” “I was really upset about my dog dying,” etc). In contrast, when we explain someone else’s negative behavior we tend to attribute it to their personality or character (“He’s an insensitive jerk,” “She’s manipulative”). Unfortunately, this means that we fail to give adequate weight to the situational factors that affect our spouse’s behavior, and instead we are quick to cast a dark shadow over our spouse’s character. It’s also important to note that sometimes these situational factors can include chronic conditions like a stressful job, a difficult child, a medical condition, or being the sole breadwinner or the primary caretaker. In the middle of a disagreement, most couples will make occasional efforts to limit the destructiveness and encourage a more productive discussion. These “repair attempts” can take many forms, including: an outright apology, a silly face, an inside joke, a gentle touch, a willingness to listen, agreeing with one of your partner’s points, or requesting a short break. Repair attempts are the “secret weapon” that prevents arguments from spinning out-of-control. To the extent that you skillfully employ repair attempts – and remain open to your partner’s attempts – you’ll find that you spend less time picking up the aftermath of a full explosion. According to Gottman, one of the best ways reduce unproductive conflict is to actively create positive moments in the relationship when the two of you are not in the middle of a conflict. What’s the connection? To the extent that the two of you feel generally positive about the relationship, you are much more likely to cut your partner some slack and to be open to your partner’s “repair attempts” during a conflict. However, when your negative feelings about the relationship start to outweigh your positive feelings (“negative sentiment override”), every little problem becomes a big deal and you will be less receptive to each other’s repair attempts. This sounds like common sense, but its importance can’t be overstated. Want to learn more? 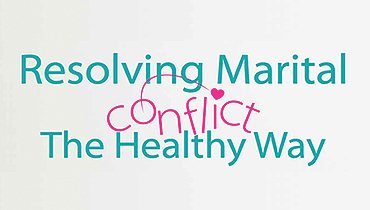 Check out one of Gottman’s many books, including What Makes Love Last? Susan Richardson, Ph.D., is a clinical psychologist and sees clients at the Maadi Psychology Center. Originally featured in Oasis Magazine – Download it here.